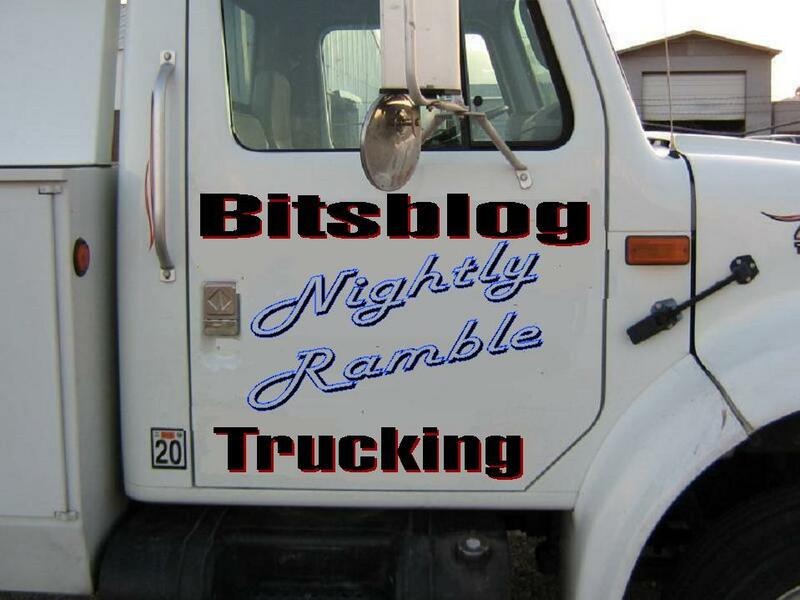 Welcome, one and all, to the most intense nightly read anywhere on the web; the BitsBlog Nightly Ramble. STATE OF THE ONE: If you’re interested in reading the speech, it’s here. Frankly, I had thought to do a running commentary on the speech, as I have done in previous years. However, I got about a quarter of the way into the project, and decided that it was just too target rich an environment.Ya know, for a while there, I considered that there was nobody on the face of the planet who could lay manure on thicker than Bill Clinton. Silly me. Obama succeeded in more position shifting, Pandering, U-turning, blame shifting defiance then I have ever seen anyone do, and that’s saying something.One point I find myself interested in is the idea that Obama even in the speech last night could not bring himself to say that we had actually won the war in Iraq. Precisely the response that I would expect from someone who has lost the political battle and is still trying to claim victory. The problem is, the leftist press will sing his praises for that victory, regardless of the reality of the situation.Obama in my view, spent entirely too much time trying to declare war on wall street last night, particularly in light of the amount of capital he has withdrawn from Wall Street, and particularly inside that context when he is so dependent on Wall Street and the investors there in to generate jobs and thereby a recovery. A dumb move, and the presidency overwhelmingly filled with them. I suspect that the only thing that Mr. Obama succeeded in last night is alienating the one political group remaining on the stage that was in his corner… the far left. Blogs around the left end, today, are mouthing weak praise for the speech, but frankly I begin to suspect a lot of it is momentum more than a serious analysis. They have yet to bring themselves to the point of understanding that the vast majority of America has already understood; By any measure, Obama is an abject failure.. Even Justice Alito found it too much to deal with. …and yes Alito’s claim has been fact checked… and Obama was wrong .That’s one of many points in the speech of last evening, that if it manages to become a narrative, Obama is in even more serious trouble. There’s a statement, I never thought to make, that he could get himself in worse trouble than he was already in. But, there it is.They really ironic part about all of this is, that it was designed to be nothing more than a stump speech in reality. He was trying to boost his fortunes. Somehow, I doubt he managed it. Not in the long term, anyway. CHRIS MATTHEWS: Idiot. Matthews, of all people, disproving the long chanted Obama mantra that we have finally arrived at a post racial America. More, he clearly identifies those responsible for that lack of progress. Absolutely brilliant. AS WISCONSIN, SO THE COUNTRY? And, Massachusetts, of course. The senate race up in Wisconsin  is showing the Republican, Thompson out ahead of the Liberal’s Liberal, Russ Feingold 47 to 43. I will add the qualifier that Thompson is not necessarily a conservative, but he certainly comes down to the right of Feingold. Then again, who doesn’t? It’s hard to overestimate is this point, particularly in light of the number of defeats for it the left wing around the country this last six months or so. Feingold was certainly regarded as having a safe prospect for reelection. That is until Obama got a hold the reins, and the current congressional leadership helped him along to where he is now. I’ll be on the ground myself in Wisconsin on Monday, so I anticipate having a somewhat closer view of that situation, and will report as I can. LANDRIEU’S PHONES: NBC’s Pete Williams is suggesting  as I did yesterday that there was no apparent attempt to tap or intercept calls from the senator’s office. The apparent motivation says Williams is that the senator was seemingly unable to take phone calls from constituents as regards health care, which she has become a large player in lately. (You will recall the Louisiana purchase. ) Actually, I find that explanation for more plausible than the knee jerk reaction it came out of the left wing press yesterday. PERSONAL NOTES: As I suggested above, I will be on the road over the weekend, to arrive in Wisconsin sometime Monday evening. As such, tomorrow night will be the last Nightly Ramble for a while. I will be posting, but because of my limited access to the depth of commentary will be somewhat limited. That will be true, I’m afraid, until such time as I manage to get a laptop going. When that happens, things will return pretty much to normal.